This is the third generation of the DDJ-SX series, and over the years, it has matured into the perfect DJ controller for the mobile DJ using Serato DJ Pro. It’s relatively expensive at USD 999, but in return, you get a high-quality product that will certainly stand the test of time. The build quality is very good, as to be expected from Pioneer DJ. 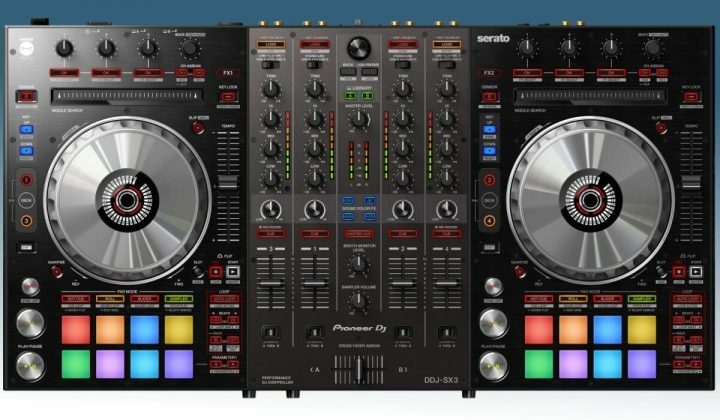 the two-tone paint job really accentuates the 2 decks and 1 mixer feeling and sets it apart from its predecessors, and the inclusion of sound color FX on the mixer is a great addition, making the DDJ-SX3’s mixer truly usable as a standalone mixer with media players or turntables connected. The DDJ-SX3 has a total of 3 microphone inputs, two of them use the channels 3 and 4 to operate. On the positive side, this means that you can use all the channel features, such as EQ and sound color effects. On the negative side, you can’t use the 4 channels AND the microphones running through those channels at the same time. That was a serious negative on the SX2, but on the SX3 you get an additional microphone input, which is a great thing. The effects section on the Pioneer DDJ-SX3 is unsurprisingly familiar if you have ever used a Pioneer DJ controller: 3 effect knobs, buttons to switch a specific effect on and off and a beat selector to set the number of beats. You can also assign each of the two effects units to any of the 4 channels. 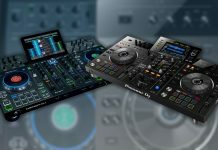 On their recent Pioneer DJ DDJ-1000 made the choice to move the effect section on each deck to the mixer in order to make the design more aligned with their professional DJ gear line. This hasn’t happened on the Serato DJ side though, so, at least for now, the approach remains the same. The jog wheels are as good as ever, and the only thing really lacking is tension control. The jog wheels are pretty stiff, so a tension control knob would allow adjusting the tension to your liking, or the situation. As a consequence, doing backspins on these jogs is a bit harder. The jog wheels are surrounded by a lot of stuff, which can feel a bit cluttered. On the other hand, it means a lot of features to play around with! There is a touch strip that is the absolute best way to navigate a track. There are key controls that allow you to lock the key and switch the key up and down, a censor/reverse button, slip and quantize buttons, deck switch buttons, Serato Flip controls, and a large pitch fader. The performance section, is again, familiar terrain: 8 high-quality performance pads that support a whole lot of Serato DJ Pro performance features such as Hot Cue, Roll, Slicer, and Sampler. And when using the SHIFT button, you can activate Cue Loop, Saved Loop, Slicer Loop, and Pitch Play. To the left of the performance pads, there is a very well equipped looping section. You can quickly engage an autoloop of 4 beats and change the size in 1/2 increments, or define your own loop size with In and Out buttons. 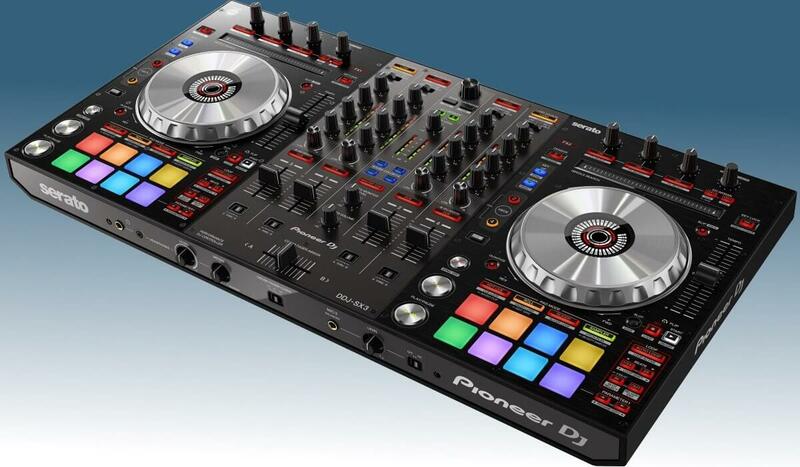 This is where the most changes are compared to the DDJ-SX2. The channel switches are no longer on the front of the mixer but on top of each channel, which is much easier to reach. 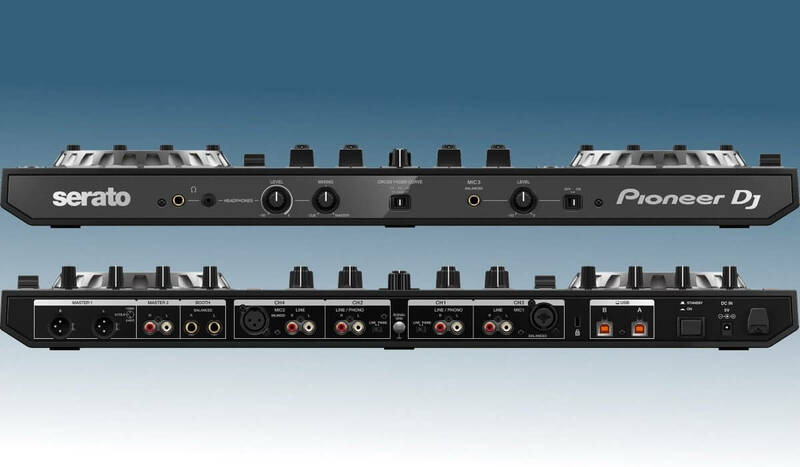 Each channel can be changed between USB A, Phono/Line (for external audio sources) and USB B, as the DDJ-SX3 has two USB inputs. In the middle, the browse section has two green buttons that allow switching the library between USB A and USB B when you have two computers connected. If you think about it, having two USB inputs is much more than a gimmick. If you are a mobile DJ, being prepared is key and having two laptops connected at the same not only means more flexibility when browsing and selecting tracks, it also means that if for any reason your main laptop fails, the backup is ready to go. 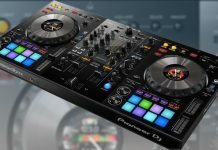 Including a second USB is a smart move from Pioneer DJ on this controller since it increases its appeal for the mobile DJ. The other addition is the sound color effects. On the SX3, we get Echo, Jet, Noise, and Filter, and they all sound really well. My only criticism here is the absence of the parameter knob to alter the effects. This is important for the Noise, as, out of the box, it tends to be a bit too loud to blend well with tracks. The line faders are well weighted and feel solid, as expected. The crossfader is very loose and should please scratch DJ’s. 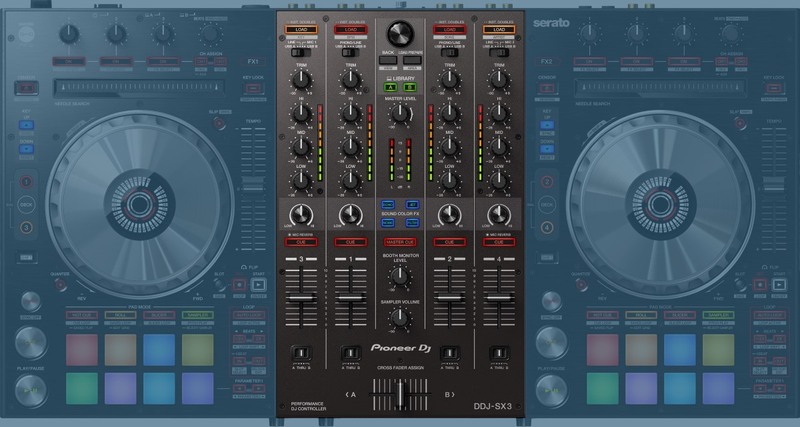 Overall the mixer on the DDJ-SX3 is much more mature than then one on the SX2. The sound color effects make the mixer more usable as a standalone mixer, since you know have at least 4 effects to play with, and the relocated channel switches make changing audio sources in dark and small booths much more convenient. The DDJ-SX3 is well-equipped when it comes to inputs & outputs. On the back, there are XLR, RCA (booth master) and TRS (booth) outputs, 4 RCA inputs, and 2 XLR mic inputs for channels 3 and 4. Lastly, there are two USB inputs. The front of the DDJ-SX3 is now much less cluttered as the channel switches are gone. Instead, we find the headphone outputs (jack and mini-jack), the third microphone input and a crossfader curve switch. 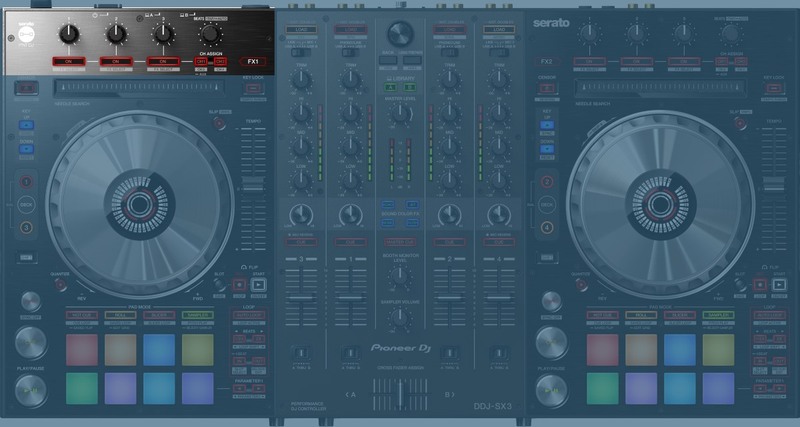 Let me be clear, the DDJ-SX3 is a great DJ controller for Serato DJ, probably one of the best out there. 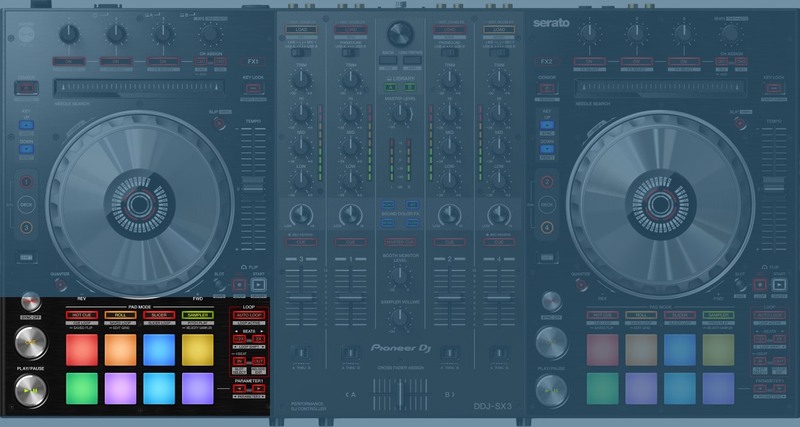 If you are a Serato DJ pro user, this is definitely a controller to consider. If you are, however, open to different DJ software platforms, there are other options out there that could be a better deal. If are OK with using Rekordbox DJ, I highly recommend the Pioneer DJ DDJ-1000. The DDJ-1000 only costs USD 200 more but comes with an amazing set of features that really are on another level. If Traktor Pro seems appealing, the Traktor Kontrol S4 MK3 is also priced around USD 1000 and comes with very interesting and innovative features. 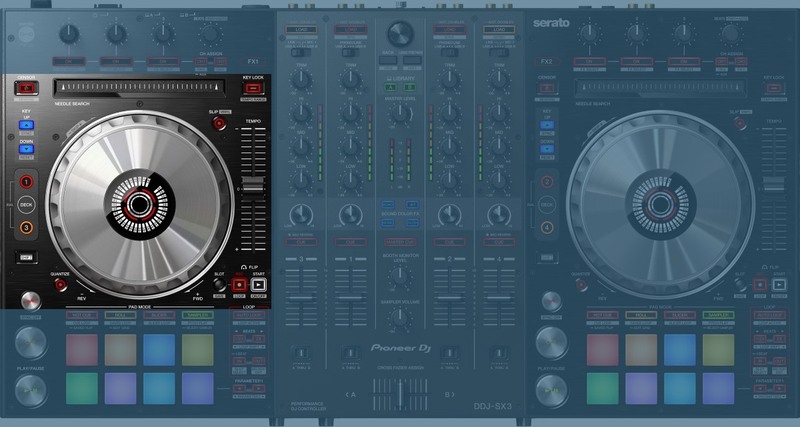 Check out my comparison between the SX3 and the Traktor Kontrol S4 MK3 for more details. If, however, Serato DJ Pro is your thing, I think the DDJ-SX3 is a very, very good option that will serve you well on the road. Let me know what you think in the comments! 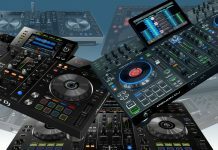 The Pioneer DJ DDJ-SX3 delivers on most fronts!